Listening to and writing about Dixieland Delight about a week ago, renewed my interest in the concerts Elvis did during the summer of 1975. And if the May/June tour was successful, then the one a month later was even better. Elvis looked impressive in his jumpsuits during the July tour, had lost weight and was in an excellent mood. Also, the demand for tickets was high, and two or more shows had to be arranged at most places. The song line up was basically the same as the one used during the previous tour, but as the tour progressed, the more varied the shows became. 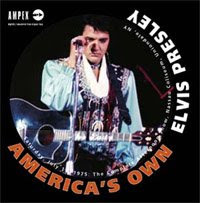 My favourite is the afternoon show Elvis gave in Nassau Coliseum on July 19 (released as America's Own), featuring "Bosom Of Abraham/You Better Run." The last three shows were held in Asheville, and the last one of these, an audience recording titled Pieces Of My Life, I listened to yesterday. What's unusual about that one is that the audience could put requests in a box before the show, which resulted in Elvis performing such rare numbers as "Return To Sender" and "Wooden Heart." But as Elvis doesn't know all the words (haven't sung them in about 15 years, I'm surprised he remembers as much as he does), that's not what makes this concert stand out. Instead it's the exciting atmosphere created by a hard working Elvis. From the driving "That's All Right" to the powerful "How Great Thou Art," this is Elvis in great spirit delivering the goods. The musicians too should take credit. Even the introductions are exciting, with Ronnie Tutt exploding behind his drums during his solo, and James Burton restarting "Johnny B. Goode" at a command from Elvis. 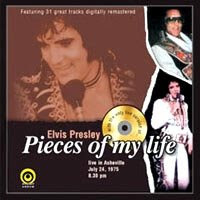 And of course, the only live version Elvis ever did of "Pieces Of My Life" is something of a treat. It's very similar to the studio version recorded a couple of months later, sung beautiful by Elvis. What I don't understand about the shows in Asheville though, is what I've read about the audiences being somewhat reserved and never giving a standing ovation. This is mentioned both in The Concert Years by Stein Erik Skar and in Lee Cotten's Did Elvis Sing In Your Howntown, too? But, listening to Pieces Of My Life, it's obvious the audience is anything but "somewhat reserved." On the contrary, most of the time it sounds like they scream at the top of their lungs, and I have to admit I have a hard time believing they manage to do so sitting down the whole time. After "How Great Thou Art," when it sounds like the whole auditorium is cooking and the roof is going to lift off, Elvis himself exclaims, "Thank you ladies and gentlemen, you're fantastic. Thank you, I appreciate it. It makes it all worthwhile." I have a very hard time believing the audience isn't standing up right there and then.